Football Investor Stewboss asked me via Twitter "will you be revisiting your Draws system on the blog anytime soon?" I think the Draws System he refers to is the one I mentioned early last season in this post. Backing the draw in the (conveniently exactly) 1,000 matches where the implied probability of the Draw was 0.25 or greater at kick-off would have boosted your account by 49.22** points, and you can all work out the ROI% on that. 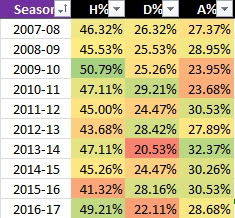 I also mentioned a simple additional filter which can be applied to both reduce the volatility and increase the profits, and published the table below showing the results of blindly backing the Draw in all English Premier League matches, applying the Draw filter (IP 0.25+) and the second filter. Unfortunately for Draw backers, last season saw the second fewest Draws in the last eleven seasons, and the third fewest in the top English division in the last 30 seasons. It's hardly a surprise then, that the numbers for last season reflected this. Blindly backing the Draw in every match would have cost you 38.92 points, using the draw filter would have lost 37.08 points, but by applying the second filter, the losses are reduced to just 4.51 points, which in the circumstances, almost seems like a win! A five year ROI of 12.25% for a simple system is excellent, and unless Draws are heading into a long-term decline which seems unlikely, the profits will soon be back. That Homes in the EPL would leap to 49.21% the season after the lowest percentage for English top division homes (41.32%) since the Second World War, makes it all the more surprising. For the record, blindly backing the Home win in the top five leagues in 2016-17 would have won you 97.80 points, an ROI of 5.36%. Eliminate the longshots with an Implied Probability less than 0.1 and the ROI climbs to 7.3% (130.31 points from 1,781 selections). ** All calculations use Pinnacle's Closing Odds courtesy of Jospeh Buchdahl's excellent Football Data website. hi. what is the second filter you applyed for draws? 1st is ip 25+, and second?